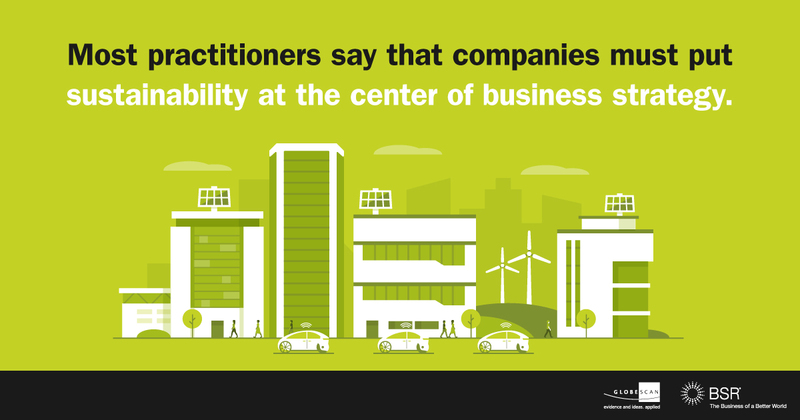 Are Companies and Stakeholders Focusing on the Same Sustainability Priorities? This year, we conducted our 10th annual survey on the State of Sustainable Business in collaboration with GlobeScan. This year’s results show that the line between sustainability issues and mainstream business issues is increasingly blurred as businesses experience the consequences of social and political disruption in a rapidly changing world. Join us at BSR18 for a conversation on stakeholder engagement in today’s world: Everyone's an Activist. This conclusion is most striking when we look at this year’s top priority issues, both included for the first time this year to capture changes in the business landscape. These are ethics/integrity (high priority for 76 percent of companies) and diversity/inclusion (high priority for 71 percent of companies). 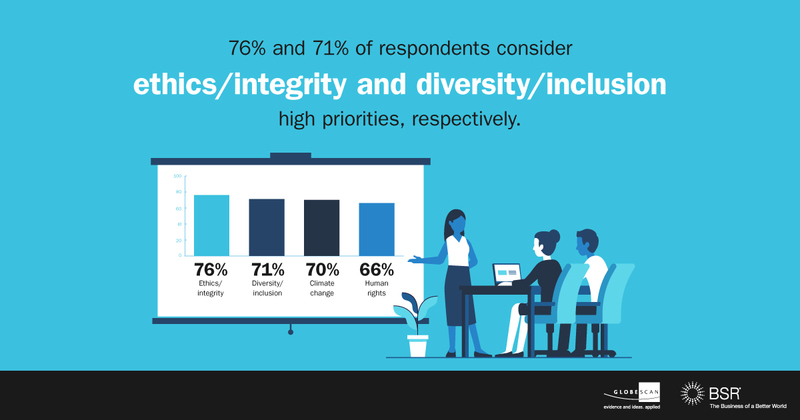 While ethics has traditionally been regarded as the domain of the compliance function and diversity/inclusion has primarily been seen a human resources issue, sustainability practitioners rank these issues at the top—suggesting, at minimum, that they are coming to be considered priorities from a holistic, organizational perspective. 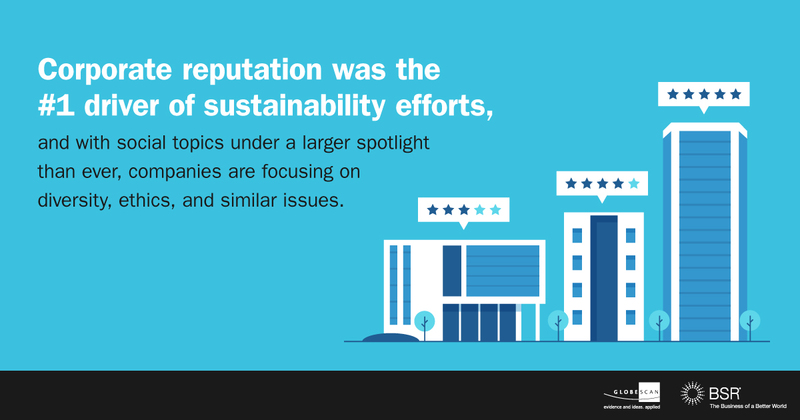 Our member companies also told us that they view corporate reputation as the primary driver of their sustainability efforts, at a time when public trust in business continues to decline. 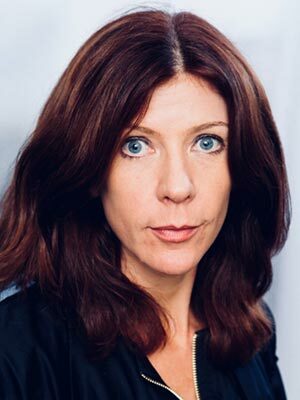 In response to this, we worked with our big data partners at Polecat to understand whether companies are correctly prioritizing the issues that are most relevant to their reputations: Specifically, we looked at online news and social media conversations around the business practices of 4,000 global companies across sectors. In online media reporting across the board, the top two priorities were (1) ethics and integrity and (2) diversity and inclusion, with climate change, water, and community health following closely behind. This seems to suggest that company priorities are highly aligned with issues in the news. While human rights is not explicitly called out separately as a high priority in online media, each of the top five priority issues that emerged (listed above) has a strong human rights component. Journalists seem to be increasingly focused on the impact that business has on communities and other stakeholders. We also used Polecat to track social media attention toward business—a more direct reflection of which issues the public is focused on than online media reporting affords. On Twitter and other social media sites, people are overwhelmingly focused on questions of corporate ethics and integrity, even more intently than in online media. The second-highest concern for the public was corporate influence over public policy—arguably a corporate integrity issue. In recent years, scrutiny over lobbying and political financing has mounted dramatically. Indeed, the level of social media attention to this issue eclipses concerns about such topics as company approaches to diversity, climate change, and water. This finding indicates that, for all the concern over reputational risk, companies may not be ready to address the public’s more challenging questions about interaction with policymakers, as well as what is perceived as the undue influence exercised by business. Given recent increases in transparency and business activism on social issues, it is likely that scrutiny of how corporate rhetoric aligns with corporate political spending will continue. BSR also considers it highly likely that questions about good jobs and tax avoidance will, over time, become more central to public understanding of what it means to be an ethical company. Overall, despite some obvious gaps, companies generally seem to be paying attention to the issues of greatest potential reputational impact. The next question is how they should organize themselves to respond. Approaches to diversity and integrity pose big questions for an entire organization, not just the sustainability function. While this year’s survey results show that three-quarters of practitioners are working to better integrate sustainability issues into strategic planning, it also indicates that they have had limited success so far. Corporate communications, procurement, and public affairs continue to be the internal areas in which sustainability has the most traction, though fewer than half of respondents deemed their organization’s communications on sustainability effective at present. Overall, the 2018 State of Sustainable Business results give reason for both optimism and caution when considering how prepared business is to respond to disruptive trends. Companies are clearly hearing concerns. However, they are still focused on messaging, reputation management, and on the symptoms—rather than the root causes—of reputational risk. Finally, companies are realizing that most of the profound challenges they face require alignment and collaboration across the organization. This has led directly to our focus at BSR on exactly how and when to collaborate with key functions across the organization, as well as our reframing of the sustainability practitioner’s role as that of change agent, futurist, and builder of coalitions.